True words are not pleasing. Pleasing words are not true. Those who are right do not argue. Those who argue are not right. The ever more he gets. Is to benefit and not to harm. Is to act and not to contend. Thank you for your excellent post Stephen. I found your last comment very interesting. Following the Tao is not easy but for me it has become sort of inevitable. I forget and slip back into old mind patterns but each time it is a little easier for me to notice that I've lost the path. Each time the way back is a little easier. I see this pattern of return growing. I hope that those who practice Tao can let, rather than make, Taoism show them the way. Nice that you are also promoting tao te ching, good luck on your work. Have you ever wonder Tao Te Ching is not a book of Tao but a book of virtues? how many virtues did you see in your readings? Maybe you want to read some rare history on lao zi and probably find that it is not even a book by him. Very intersting point Mak Jo Si. It is impossible to write a book on Tao because the Tao itself is undescribable. We can however see its effects (virtues.) Well stated. 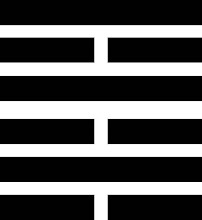 Each trigram represents a situation, If one has what is required and is in the correct place and time 'good fortune' will result otherwise varying fortune and ultimately bad fortune results i.e. a good beginning but a bad ending. a skilled person can reverse engineer by finding the required situation and see what is required to attain the desired outcome or one may cast the arrow stalks (an ingenious early way to randomize) and allow heaven to serve some constructive criticism to contemplate. Thank you for your insights I found them valuable.